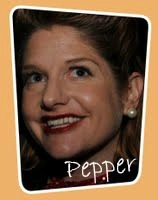 Julia “Pepper” moved to New Orleans in 2007 and fell in love. She used to be a professional nomad, moving from city to city almost every three years but during the fall of 2010, she realized that DC was not NOLA, and that New Orleans is her true love. Originally from Austin, Texas, Pepper enjoys live music, outdoor festivals, and long meandering walks with her dog Nina (named after Nina Simone). While Pepper is her super-cool identity, her alter-Muffy ego is a real life super-nerd. She loves podcasts (RadioLab, PRI, The World in Words, etc), playing games, reading about the evolution of different languages, and exploring every little corner of every place she travels. Although Pepper helped launch the Muff-A-Lottas, she is a horrible seamstress, crafter and dancer. Thank goodness she has a great sense of humor and winning personality!